Step 1： Search "Smart Life" on App store, Google Play or Scan the QR code on User Manual to download and install it. Step 1: Set your Echo Speaker by Alexa APP/Google Home APP. Step 2: Enable a Skill which is "Smart Life" in Alexa APP/Google Home APP. Step 4:Discover the smart plug and control your device with voice. Note: Set up Smart Life before setting up Alexa/Google. Turn on or turn off connected devices wherever you are at any time through your smart phone. The Smart Life APP allows you to add as many Smart Plugs as you'd like to keep track of multiple appliances, whenever, wherever. You can use the free app to create schedules / Timer to automatically power on or off your home electronics and appliances at anytime. Scheduling allows you to prevent power-hungry devices from being left on longer than needed. Exgoofit Smart Plug works with Wi-Fi router without the need for a separate hub or paid subscription service. 1. The samrt plug can only support 2.4G network when connecting. All Within Reach: Control your electrical items via your phone whenever and wherever you are after downloading the FREE APP(small space)as long as there is a network.Ideal for someone who can not move around very well and needs easy access to turn on/off a device. Smart and Easier Life:By setting schedules and timers for the A/C units,you can prepare a crockpot meal and get home with dinner's ready, turn off your nightstand light after sleeping. Forget to shut things down? Forget to turn on/off the washer/dryer? Worry about overcharging? Want to give the appearance of someone is home? Gosund Smart Plug can help you control your home appliances,eliminate wasteful standby power and reduce energy use,save on your electric bills and extend product life. Compatible with Amazon Alexa / Google Home / IFTTT; Compatible with Android 4.4. above & iOS 8 above; Does not work with SmartThing, Homekit. Only supports 2.4GHz Wi-Fi network. 1 Year Warranty, Money Back or Exchange. 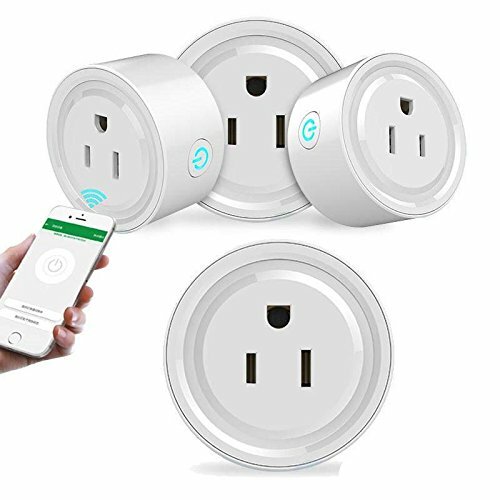 Easy to Install and Safe: Just plug a device into the wifi outlet and connect to your Wi-Fi network with APP "Smart Life"